Quality Breeder of AUSTRALIAN LABRADOODLES! See our Puppy Availability Page for More Information! Wonderful Girl Puppy Available April 26th! Welcome to Ridgeline Australian Labradoodles, LLC! Welcome to Ridgeline Labradoodles! We breed happy and healthy Australian Labradoodles with wavy and curly fleece coats in medium sizes in Washington state. My goal is to provide excellent dogs for family pets and companions. I hope the puppy you receive from us will be the one you always remember as the best dog you ever had! Temperament is my priority, health is guaranteed and beautiful conformation is a bonus. If you are looking for a superior quality puppy with a wonderful personality, which has been lovingly cared for and well socialized by a small family breeder then your search ends here! I understand how important it is to find the right fit for your new life-long friend. I also understand how important it is to find a breeder you can trust and relate to. 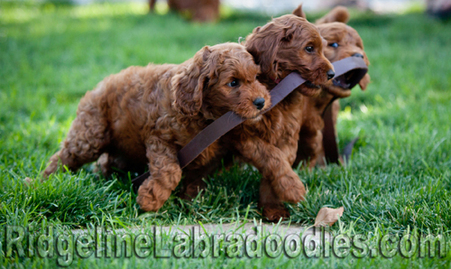 Our family has been enjoying Labradoodles since 2005 and began our small breeding program in 2009. We love their joyful, sociable, and intuitive personalities. Their low to no-shedding, soft and silky, allergy friendly coats are wonderful too. I am proud to have earned a reputation for raising happy and healthy puppies who share a consistent look, fantastic personalities, and many have our signature red coats. I look forward to showing you the newest additions to our family on our Puppy Availability page. I'm accepting Puppy Applications for pups available this spring. I'm thankful my husband works hard all day, so I am blessed to be able to stay home and raise our sons, be with our adult dogs Flicka and Boomer, and raise precious puppies. What a wonderful life! When our oldest son became a teenager I felt it was time to nurture young ones again. 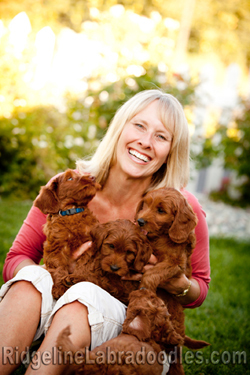 While looking for something I could call my own, I soon realized going back to a corporate career was not for me, but my love for and skill with animals could be put to good use in breeding Australian Labradoodles. We received our beloved dog Flicka in 2005 when we were the first guardian family for Seattle Labradoodles, and with their generous help and encouragement our adventure began. While some breeders have numerous dogs, additional staff members, and even facilities, we are choosing to remain small and operate as a true family breeder. This allows me to give each puppy a maximum amount of socialization and care, and enables me to give you personal attention throughout the process. Raising the litters in my home allows me to know each puppy’s unique personality while ensuring everyone gets the individual attention they deserve. We do not keep dogs in kennels and I can’t keep all the adult dogs in our home, so they live as pets in guardian homes with other families. When the females are ready to deliver they come live with us until the puppies are weaned, then they return to their home and we continue to raise and place the puppies. If you are interested in being a potential guardian family please read the responsibilities outlined in Our Guardian Program and feel free to fill out a Guardian Application. Families living within two hours of our home are given preference. We live in beautiful north central Washington near Winthrop, which is located northwest of Wenatchee and the Lake Chelan area. We are conveniently located within a day's drive near many communities including Seattle, Bellevue, Medina, Redmond, Issaquah, Tacoma, Bellingham, Spokane, Wenatchee, and Boise to name a few! We also have puppies living in other states and Canada, and will gladly give you more information regarding potential airline travel options. We are proud to have Ridgeline puppies living in Washington, Oregon, California, Idaho, New York, Alaska, Colorado, Florida, Maryland, Massachusetts, Kentucky, Missouri, Kansas, Ohio, Minnesota, Texas, Montana, Washington DC, Illinois, Georgia, New Jersey, North Carolina, Philadelphia, Vancouver and Kelowna, British Columbia, Edmonton, Alberta, Whitehorse, Yukon, and Toronto, Ontario Canada! There are different classifications of Labradoodles based on how many generations they have been bred. The multiple generations of breeding, or multigens, should produce the finest coats, qualities, and appearance. While the breed is in a stage of continued development, we only breed multigenerational Australian Labradoodles because of the consistent quality of their puppies. While Labradoodles are a cross between a purebred Labrador Retriever and a purebred Poodle, most people don't realize the Australian Labradoodle is a breed developed over 20 years ago in Australia. This specific lineage is a mix of several purebred breeds including the Labrador Retriever, the Poodle, and the English or American Cocker Spaniel. To be classified as an Australian Labradoodle the dog's pedigree must include these breeds and it's helpful if it can be traced back to the kennels in Australia where the breed first originated. The Australian Labradoodle may be the pedigree accepted by the American Kennel Club if achieving purebred status were to become a priority. Please see our Breed Info page for more information. Please use the links to learn more about us and I look forward to hearing from you!